PulseBlasterTM is a general-purpose, multichannel, programmable TTL pulse generator / digital word generator. It offers up to 24 independently controlled channels, powerful program-flow features, and variable output rates ranging from ns to days per interval. PulseBlasterTM implements a novel 80-bit Very-Long Instruction Word (VLIW) architecture. Due to its versatility and intelligence, it is most commonly used as a powerful timing engine for applications requiring sophisticated pulse sequences and output patterns, precision timing of wide-ranging intervals, and complex system control. The standard form factor is PCI-e, and standard clock frequency is 100 MHz. 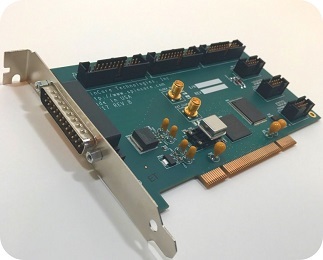 Compact-PCI, PCI Express, and higher clock rates are available, currently up to 500 MHz (the PBESR-PRO series of boards). The SpinAPI package available for download on the Software Downloads page.